Altesautoschande might not exist as a German word, but I feel the urge to coin it. I reach for this neologism this month – literally translated as ‘old car shame’ – at the news of Volkswagen’s imminent change to the handsome machine parked on my drive. Caring two hoots about the vagaries of fashion might seem shallow, but to anyone who invested the required £30,025 for the car I’m piloting for our magazine, I’m sure it’s impossible not to feel some sort of disappointment to hear of your investment’s imminent metamorphosis from latest thing to yesterday’s news. Yet there is comfort for all those Sharanists out there who, like me, might feel aggrieved: the all-new Sharan, as showcased in this month’s edition from the podia of Geneva, is… just about blooming identical to the old one. That’s a wise move. Very Audi, I’d say: keep your big changes under the skin and thereby help to preserve the values on all those near-new Sharans, thus fortifying the purchasing argument for the new ones. It’s the kind of customer care for which Land Rover Freelander owners must weep into their pillows. 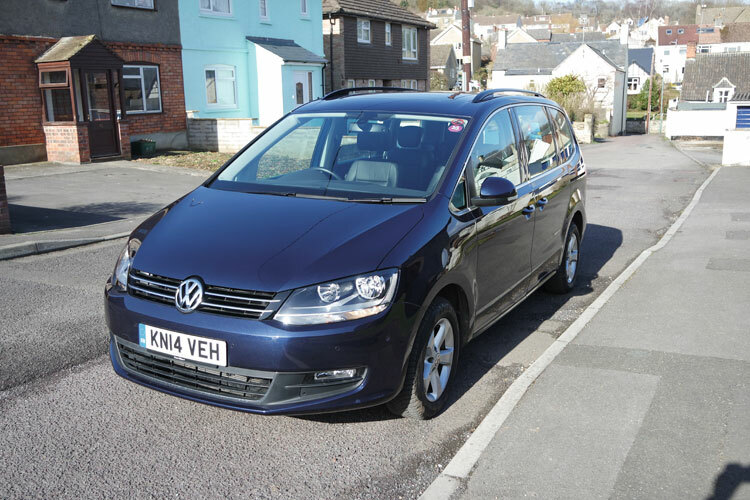 The changes to the Sharan are a bit like manifesto pledges: it’ll be cleaner (as per mandatory Euro-6 regulations), go 15 per cent or so further per gallon and apparently trigger a safety response when anticipating accidents (thus removing yet another use for your mother in law). Fuel-wise, 15 per cent on the official 49.6mpg should mean you would have a car capable of 57.04mpg, or thereabouts. You might want to factor in the traditional diesel additive of a pinch of salt there, seeing as 49.6mpg in the current model would probably be achieved only if I removed all the seats, taped over every bodywork detail, went out only when the wind was behind me and drove stark naked. That doesn’t, I stress, constitute a complaint about the ‘old’ car I’m driving here: with 40mpg plus pretty achievable, and fuel prices falling (at least at time of writing) so shockingly that by 2019 it’ll be half the price of milk, the fiscal side of Sharan ownership is looking chipper. We’re driving into the foothills of spring now; the worst the weather can do will probably not involve anything that puts the winter tyres under too much duress. But changing for the extra-grip rubber was certainly a worthwhile exercise. They spell a far more keen level of grip on iffy tarmac and markedly boost your braking distances. Alongside the Sharan, I’ve been looking at some of the brightest and prettiest contenders in the SUV class this month, including Mazda’s CX-5 and Honda’s CR-V. Aside from their inability to seat a throng, their shortcoming is in their badges: they sound like extras from Star Wars. Thankfully the one change VW failed to make for its upcoming Sharan signals the cleverest thing it could do: the name. Twenty years ago, we all sniggered. Two decades on, it’s car-speak for class. Spring heralds a chance to breathe deeply and exhale stress – through that clever panoramic sunroof. The design belies this car’s size, but the turning circle reminds you she’s some ship. A tighter one should be on the revised car’s shopping list.